CRYPTIC STUDIOS is visiting A&AA! 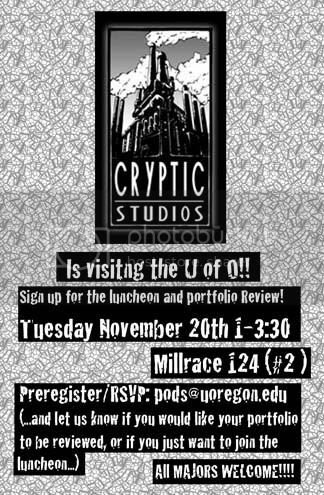 There will be a luncheon and portfolio review. Great networking opportunity and to find out about the gaming graphics industry as well as some tips to strengthen your own skills! Cryptic Studios is a leading independent developer of Massively Multiplayer Online Role Playing Games, with a reputation for delivering profitable, on-time, on-budget titles. It developed the innovative and successful City of Heroes, as well as its subsequent expansion, City of Villains. Both titles garnered numerous awards from leading enthusiast press including GameSpy’s Game of the Year award in 2004. Visiting Artist: Donald Morgan. Nov. 29, 2007 @ 7:30PM. 177 Lawrence Hall.